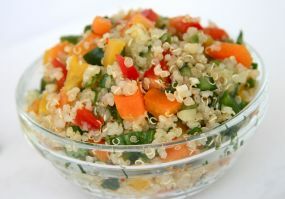 Quinoa Salad is a Bolivian food recipe with vegetables. Wash quinoa until the suds and bitter taste are gone. Simmer quinoa in water for 15 minutes and cool.